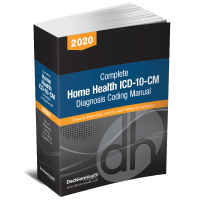 Ensure compliance with Medicare CoPs, prevent costly survey sanctions. Protect your agency today! Prevent citations and avoid sanctions that could devastate your agency with the Home Health Survey Trainer, 2019. Featuring tools and tips from real-world agency experiences, the Home Health Survey Trainer, 2019 will help you set up a compliance process to catch problems early on and put a corrective action plan in place before your agency is hit with a steep fine. One home health agency received a civil monetary statement of deficiencies – $6,000 per day, retroactive – by the time they had received the letter, their agency was already in for $165,000! Protect your agency with this one-of-a-kind guide. Learn how to revamp your policies so that your agency avoids deficiencies altogether. NEW! Impact of revised CoPs onthe survey process, common survey deficiencies and how to conduct a clinical record review. NEW! Survey prep tools including a new survey risk assessment tool. Ensure compliance with therapy reassessment every 14 days. Surveyor will be looking at whether or agencies met those requirements and documentation to show progress. Deemed status - Is it worth your while? 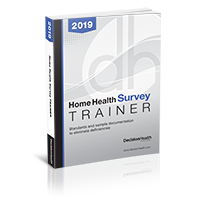 The Home Health Survey Trainer, 2019 provides you with the plain-English guidance needed to lessen your risk for survey citations, alleviate staff anxiety associated with surveyor interviews, perform internal readiness audits and ensure CoP compliance.